Slurry Lagoon Liners for manure storage on farms. Nitrate Vulnerable Zones (NVZs) and slurry storage. The European Commission (EC) nitrates directive requires areas of land that drain into waters polluted by nitrates to be designated as Nitrate Vulnerable Zones (NVZs). Farmers with land in NVZs have to follow mandatory rules to tackle nitrate loss from agriculture. NVZs now cover 62 per cent of England. Too much nitrate in fresh water can cause a wide range of harmful effect to rivers, stream and lakes. The EU Nitrates Directive recognises that most of the nitrate in fresh water (between 50% and 60%) comes from agricultural sources. So where there is too much nitrate, farmers need to do things in ways which reduce the risk that nitrates will pollute watercourses. The measures apply in designated Nitrate Vulnerable Zones (NVZs) – locations where the threat of run-off into watercourses is most acute. What this means for farmers is they are having to increase their capacity to store larger volumes of manure and a cost effect way of doing this is by creating an EPDM Rubber lined slurry lagoon. • Long life span when designed, constructed and maintained correctly using high quality Rubber Geomembranes. The image above shows a Lagoon construction in progress. 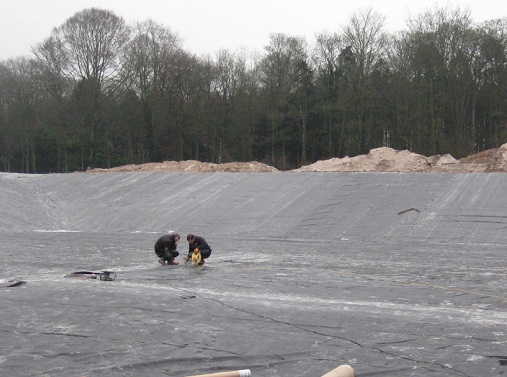 The 15m x 30m Firestone 1.0mm EPDM panels are positioned on top of the geotextile underlay and then seams created using the Firestone QuickSeam System. For smaller lagoons we can prefabricate SealEco EPDM panels in our factory, up to a maximium single panel size of 40m x 45m, saving on site welding costs. SealEco EPDM and SealEco Butyl panels can also be site welded for larger installations using our patented Hot Bond Welding presses.